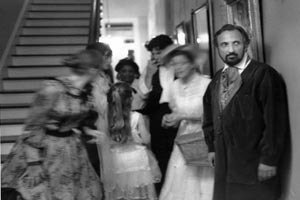 A drama that explores Edgar Degas' scandalous visit to New Orleans in 1872. Edgar Degas, the French Impressionist painter, is struggling with the conflicts of helping his brother and Louisiana relatives in America, and pursuing a career as a painter. Fame and spiritability come to a head when he discovers he is still in love with his sister-in-law who is pregnant and blind. Edgar struggles with ethical priorities when he discovers his aggressive charming brother has gone through all the family money in an attempt to save his uncle's sugar business. One integrated int/ext.set. We are in a two-story rental house on 2306 Esplanade Avenue, New Orleans, Louisiana. It is 1872. A double parlor with the remnants of grandeur: a glittering chandelier, an elegant tattered sofa, a mahogany desk, and a high-back chair. To the right, two floor-to-ceiling windows open onto a galley; to the left, a door to the pantry. Upstage two matching parlor doors lead offstage to an unseen staircased grand hallway that connects the upstairs, and the front and rear of the house. Outside we hear the clanging of a random mule-drawn streetcar. Throughout the play, Degas’ paintings or the rapturous colors within them are projected onto the rear wall, lending their transparent blues, pinks, and violets to the bleak setting.